The Ultimate Birds of Prey Experience Day! 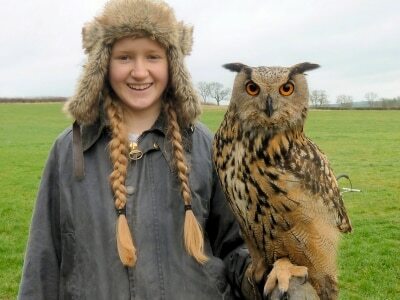 A birds of prey experience day to fly, handle, feed and get up close to our owls, falcons, hawks, buzzards and eagles. A Bird on the Hand Birds of Prey Experience is a great gift for your special person and you have my unique money back guarantee they will have a fantastic time. My customer comments say it all. 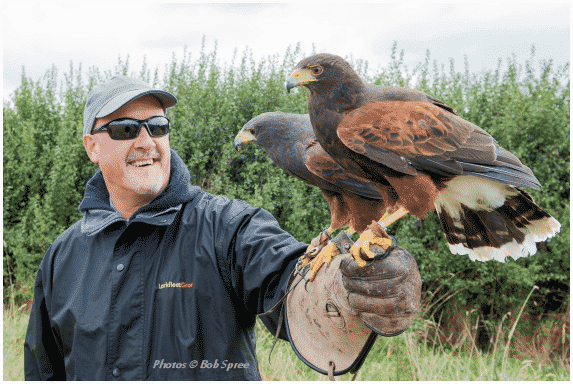 What makes my birds of prey experience days so special for you? Enjoy being fully hands on with the birds. Experience the feeling of privilege having raptors sit on your glove and trust you. Visitor comments that fill you with confidence. A great relaxing location in the countryside. Small groups of six ( 20 is not uncommon elsewhere ) allow personal attention and you get more time with the birds. Opportunity to feed a falcon on your fist, an experience not to be missed. See and feel the power as it tears at flesh and bone. My 45 years of falconry experience shared with you to make a great day. A wide variety of birds for you to enjoy. “Close and wonderful encounters with beautiful birds"
We are a family of four adults and had a wonderful few hours with Andrew and his birds. This is a great place to see and handle some lovely birds in a great setting. 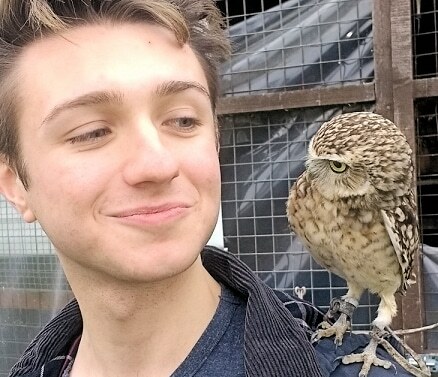 There was no hype or busyness that can sometimes be part of any tourist attraction - this was a lovely gentle afternoon where we got to handle some amazing birds - eagle owls, burrowing owl, peregrine falcon and a Harris Hawk. The highlight for us was this mischievous little burrowing owl, Pod, who stole our hearts with his antics - would recommend this wonderful experience to anyone interested in birds - fabulous day and the birds look well cared for. A fantastic gift! Three hours of joy! Packed half day hands on birds of prey experience days that are both fun and educational. Your session will be spent seeing, handling, feeding & flying many types of bird, which include several species of Falcon, Hawks, Owls and Eagle. All birds of prey experience days covered by our money back satisfaction guarantee so you can give this gift in complete confidence. This full action packed day takes place out in the countryside with the morning being spent getting to know the birds. Your opportunity to be up close feeding handling and flying some of our favourite stars. The afternoon is spent out on the farm. In summer we usually fly an eagle or European Eagle Owl and then we are out into the countryside for a walk with a team of Harris hawks who show there natural capabilities while popping down to you for the occasional titbit. In winter we are out with the Harris Hawk hunting team plus dog and ferrets. There is a variety of different birds of prey experience to choose from. They all come as a gift voucher valid for up to 12 months. 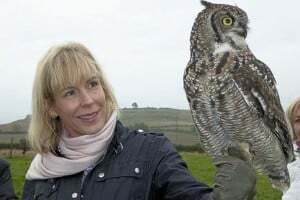 Choose from a half day "Bird on the Hand" session, our most popular event or the full day "Falconry Adventure" which includes a hearty lunch or our "All Owls" for the owl lovers or many others. They all come with my unique 100% money back guarantee.